Special thanks to Che and her wonderful lovebird Igor for sending us feedback on Igor’s recovery! 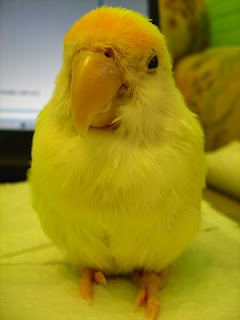 “Hello, I wanted to share a story about your products and my lovebird Igor. 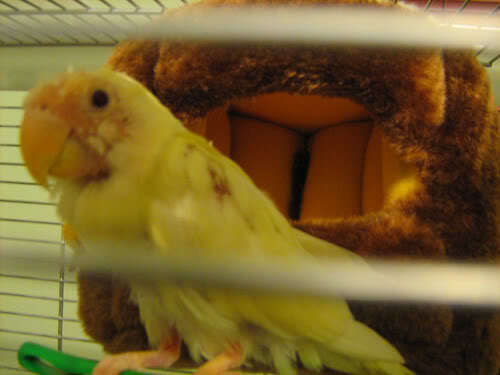 Igor was a ragged and naked little lovebird who I saw in a pet store and decided to rescue. Igor was featherless in many places and the story the pet store gave me was that he (or she) had been picked on by the other lovebirds and driven out. They said the feathers would grow back. After I brought Igor home I took him to the vet who said that he probably had PBFD. I went home and researched the disease, seeing horror story after horror story about the disease. When the tests came back positive I was crushed. A second vet I took him to months later said “Get Igor eating Harrison’s!” It took awhile to get Igor converted but after a few weeks Igor now eats it exclusively (High Potency Super Fine). Now, Igor is a new bird! His feathers have grown back! Which was astounding? Especially with the disease he has. His energy level has skyrocketed, vocalizations increased, and now Igor has a bright future ahead, PBFD or no! As you can see from these photos, Igor has made major improvements in just a very short time. We would once again like to thank Che for allowing us to use her wonderful photos! All photos courtesy of Che (and Igor).